Bobby Trujillo started in the martial arts at the age of 5 years old under his father Shihan Danny Trujillo. He holds the rank of second degree black belt. 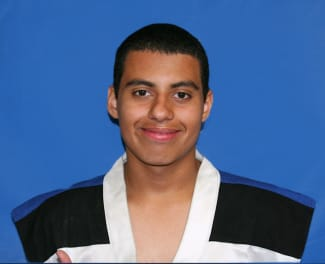 He is on the Chozen Demo Performance Team and on the Chozen Ones Sparring Team. Bobby enjoys helping kids in reaching their goals. He enjoys assisting his SenseiÆs in class. Bobby is one of Chozen top comptitors and love performing at local tournament. He has attended in Instructor Colleges for Martial Arts. Bobby is attending Bonita High School in La Verne. Keeps a good connection with his church ôFaith Commiunty Church.